DIRECTV NOW for Android is a live TV streaming app with live TV channels on demand movies. With True Cloud DVR (beta), you can indulge on your favorite TV series and movies along with other entertainment shows like news, sports and watch them as they happen. Instantly access the top entertainment show without any contracts or hassles of having a satellite arrangement. It has more channels than any of the competitors and also includes local channels. Without any rules and regulations, enjoy TV and join the revolution. 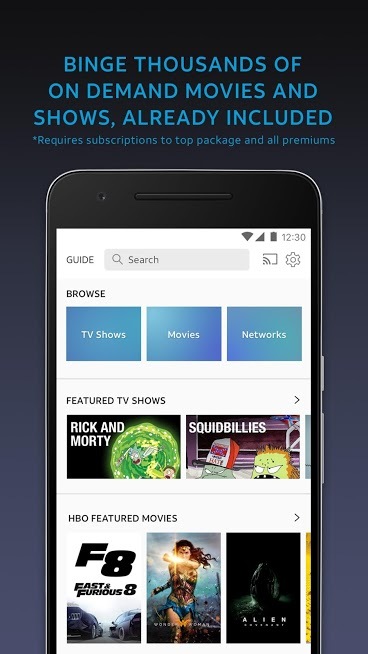 DIRECTV NOW for Android is one of the best streaming services with most of the top channels and on demand content available with the cheapest package. The service offers four packages, they are, Live a Little, Just Right, Go Big and Gotta Have It. Live a Little has about 60 channels and covers most of the top channels. Just Right has 80 plus channels with more sports additions. Go Big with 100 channels has lot more in terms of news, sports, family and movie. Gotta Have It has 120 channels with all the networks the company can offer. The content is directly streamed from an internet server so you can access it from a mobile, TV, web browser or a media streamer. The DVR is used to record up to 20 hours of programming and it is stored in cloud. To stream on TV, you will need an Amazon Fire TV or Fire TV Stick or an equivalent service. You can use any common web browser like Chrome or Safari, to watch content on a computer. DIRECTV NOW service is available only in US. DIRECTV NOW for Android has a great collection of channels that cater to different genres and an eclectic mix of people. The app has affordable plans that cater to most people with all the commonly enjoyed channels can be availed at the base rate itself. It offers a free trial for the entire package starting with $40 per month for live a little package. The most expensive is the Gotta have it package which can be availed at $75 per month.